Atomically thin materials – in particular graphene – are rapidly becoming some of the world's most valued materials, offering enormous potential for industrial transformation across a diverse range of applications. From superior forms of energy storage and transparent electrodes for mobile phone displays to filtration membranes used in water treatment and biomedical applications in tissue regeneration, these 'wonder' materials are attracting the attention of companies worldwide, including in Australia which has rich reserves of the raw materials. 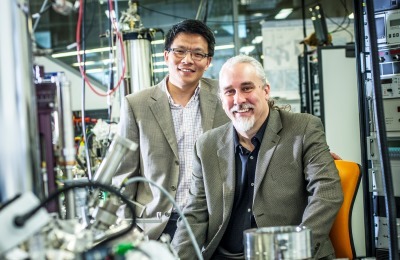 The Monash Centre for Atomically Thin Materials (MCATM), a joint initiative between the Science and Engineering faculties at Monash University, is the first centre of its kind in Australia. An international hub for research excellence in novel 2-D materials, this multidisciplinary centre brings together world-leading expertise from across Monash and with national and international partners and industry. With state-of-the-art facilities and technology, it offers a platform for researchers to gain a deeper understanding of how atomically thin materials integrate with each other or with other materials, to achieve engineering solutions and realise new applications. This Centre puts Australia on the map as a world leader in atomically thin materials research and commercialisation.